Carnival Zombie is a co-operative survival horror game where players are trying to flee Venice to escape the Leviathan, a dark evil creature lurking in the lagoon, whilst its minions of the infected walk the streets at night. 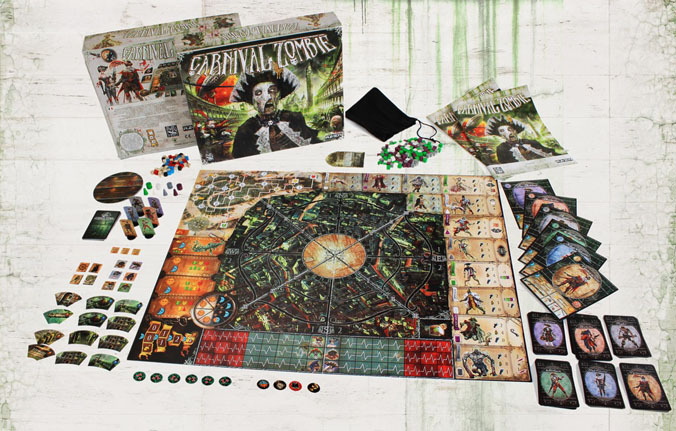 In Carnival Zombie, 1-6 players have the choice of defeating the Leviathan or, doing the slightly more sane and less heroic thing, of fleeing Venice completely. Neither option looks easy though. The game is split into day and night phases. During the day, the players move through the city using the map in the corner of the board showing the network of streets between the different locations. Some routes are harder than others (taking more time) and some locations become sunken during the game (players lose if situated there at night). Various specific locations, which are far from the start of course, are where the different finales can take place. So, players need to decide where they want to head to as each finale has its own set of rules. When night falls, the players must defend the location they are at which means being surrounded by hordes of different minions of the infected, as well as some boss monsters too, working their way towards their makeshift defences. If they survive until dawn, they get to move through the city again and repeat this until they win or fail.